YouTube is the educator entertainer that never sleeps. One video leads to the next, literally forever. (YouTube does have a kids channel which is supposed to be a safe space for kids.) They have “YouTube Kids,” which was supposed to help reassure parents. But if your kid is at a random computer and just goes to YouTube.com, or clicks on a link and ends up there, they’re off down Recommendation Alley. In response to fears that YouTube was promoting bad things to children, unintentionally or not, and thinking about a possible sociology class exercise, I decided to do an exercise where I start from a Disney princess video and then select from one of the top-10 recommended videos on each page to try to get to things that are bad for children. (In the possibly-vain hope that my experiment wouldn’t be contaminated by my own use history, I used an incognito window without logging in to Google.) My goal was Nazi propaganda, and my strategy was to aim for adult stuff, then look out for disturbing, racist, or violent content. As children do. After searching for “Disney kids,” I chose this innocent Disney Princess video, and starting clicking on recommendations. And from there back to suffering children. And finally back to Disney Princesses. Phew! 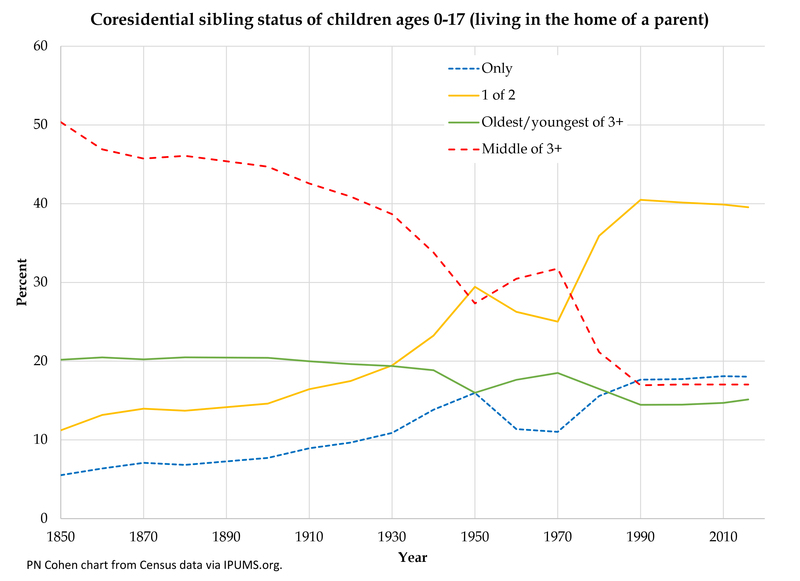 As I go about my day, revising my textbook, arguing with Trump supporters online, and looking at data, I keep an eye out for easily-told data short stories. I’ve been putting them on Twitter under the label Now You Know, and people seem to appreciate it, so here are some of them. Happy to discuss implications or data issues in the comments. 1. 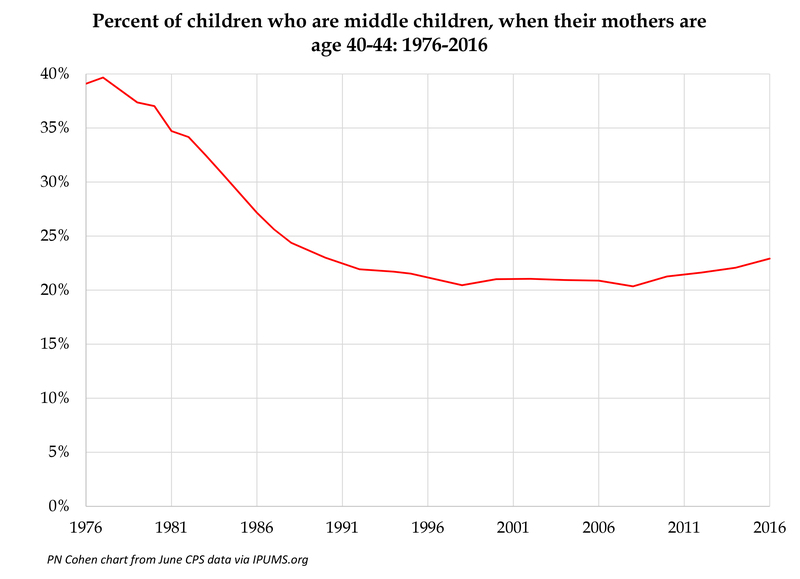 The percentage of women with a child under age 1 rose rapidly to the late 1990s and then stalled out. The difference between these two lines is the percentage of such women who have a job but were not at work the week of the survey, which may mean they are on leave. That gap is also not growing much anymore, which might or might not be good. 2. In the long run both the dramatic rise and complete stall of women’s employment rates are striking. I’m not as agitated about the decline in employment rates for men as some are, but it’s there, too. 3. 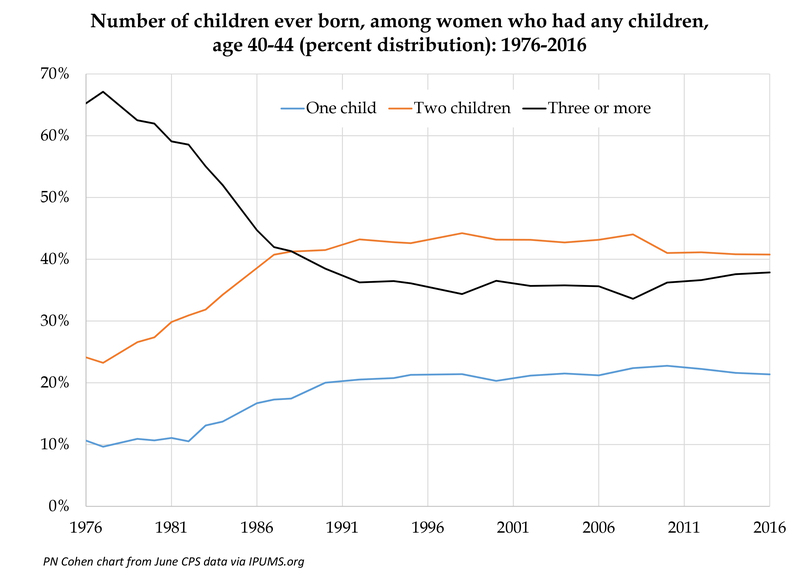 What looked in 2007 like a big shift among mothers away from paid work as an ideal — greater desire for part-time work among employed mothers, more desire for no work among at-home mothers — hasn’t held up. From a repeated Pew survey. Maybe people have looked this from other sources, too, so we can tell whether these are sample fluctuations or more durable swings. 4. 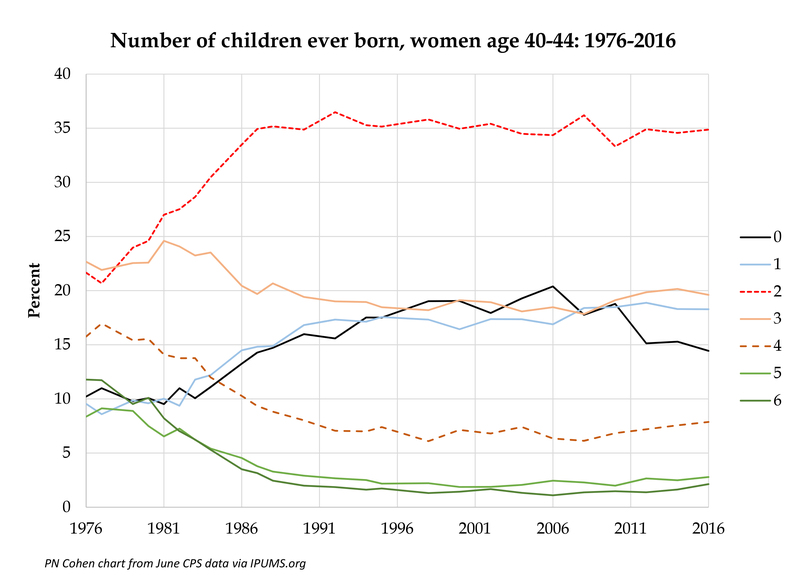 Over age 50 or so divorce is dominated by people who’ve been married more than once, especially in the range 65-74 — Baby Boomers, mostly — where 60% of divorcers have been married more than once. 5. People with higher levels of education receive more of the child support they are supposed to get. Or more recently than I thought, anyway. Note: Rose Malinowski Weingartner, a student in my graduate seminar last year, wrote a paper about this concept, which helped me think about this.